on the two corners of Montgomery Avenue and Levering Mill/Old Lancaster Rd. All participants are invited to a dairy and parve dessert reception before and after lecture. 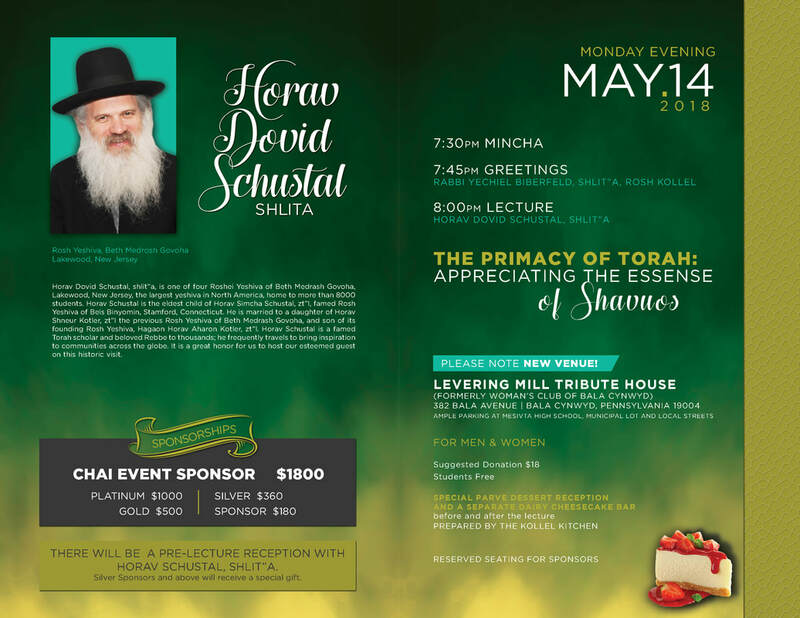 There will be an exclusive pre-lecture reception with Horav Schustal, shlit"a for all sponsors. Silver Sponsors and above will receive a book. The Dr. David E Epstein z"l Memorial Lecture. Dr. David Epstein, was one of the Kollel’s founders and served as President of its Board of Directors from 2002–2004. His leadership was instrumental in nurturing the Kollel from a fledgling organization into the community bastion of Torah learning that it is today. Dr. Epstein was a consummate physician, a model builder of Torah and community, and above all, a loving husband, father and son. In recognition of his integral role in the Kollel's history, the Annual Lecture is named in his memory. We are confident that it will provide an additional source of merit for his neshama for many years to come. Horav Dovid Schustal, shlit”a, is one of four Roshei Yeshiva of Beth Medrash Govoha, Lakewood, New Jersey, the largest yeshiva in North America, home to more than 8000 students. Horav Schustal is the eldest child of Horav Simcha Schustal, shlit”a, famed Rosh Yeshiva of Beis Binyomin, Stamford, Connecticut. He is married to a daughter of Horav Shneur Kotler, zt”l the previous Rosh Yeshiva of Beth Medrash Govoha, and son of its founding Rosh Yeshiva, Hagaon Horav Aharon Kotler, zt”l. Horav Schustal is a famed Torah scholar and beloved Rebbe to thousands; he frequently travels to bring inspiration to communities across the globe. It is a great honor for us to host our esteemed guest on this historic visit.